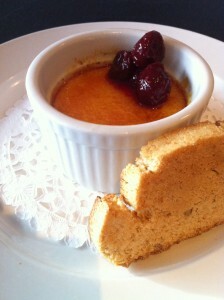 Come Enjoy Vancouver Foodsters Creme Brulee Challenge On Now! Do you have a bit of a sweet tooth? 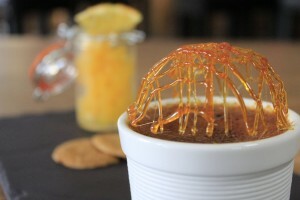 If so, why not try out these unique Creme Brulee creations and vote for your favourite? 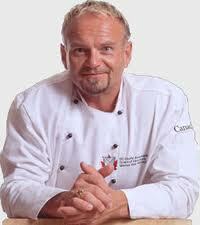 On now is Vancouver Foodster’s Creme Brulee Challenge. I am one of 4 judges for this competition. I will be visiting and making my tasting notes and voting for my favourite. You should too. Details of the event are below. Enjoy! 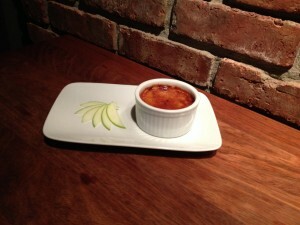 Welcome to the Vancouver Foodster Crème Brulee Challenge. Restaurants and bakeries from all over the city were invited to enter their crème brulee into this challenge, most have created a special crème brulee just for this challenge. 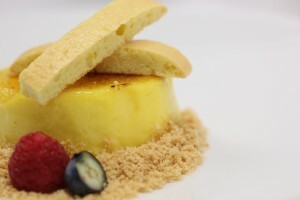 Each restaurant and bakery will be featuring their crème brulee on their menu from April 11-30, 2014. How Does this all Work? For the public challenge, you are invited to go out and order any or all of the creme brulee in this challenge, then you decide who you think has the best creme brulee creation for the People’s Choice award winners. Share your experiences: Tweet (and don’t forget to tweet or instagram your photos) throughout the challenge, our twitter and instagram address is @vanfoodster and the hashtag is #CremeChallengeYVR please include this hashtag in all your tweets during the challenge. 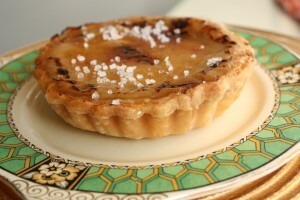 Voting criteria – some things to help you judge your favourite creme brulee creations – keep these things in mind: originality, creativity, uniqueness, traditional, non-traditional, price, value and most importantly taste. Here are the 9 Creme Brulee dishes in this challenge, listed in no particular order other than when they were received by us. 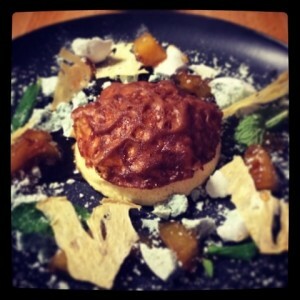 Description: Caramelized granny smith apples with a salted caramel custard.‎ Finished with a touch of citrus salt. Chicken wings are a staple for many parties, bbqs and sporting events. It’s also fun to eat with friends on an evening out. Richard Wolak, aka vanfoodster, has announced his latest challenge, the “Best Chicken Wing Challenge” here in the Vancouver area. Check out his press release below and further links to the challenge. Don’t forget to try them with wine or beer! Vancouver, BC – Everyone loves Chicken Wings and they are a popular dish at local eateries and beyond. 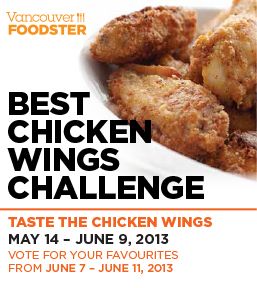 I chose Chicken Wings for my next challenge said Richard Wolak, this challenge features 13 participating restaurants and pubs in Vancouver, Coquitlam, and Richmond that runs from May 14 – June 9, 2013. Participating restaurants are either showcasing Chicken Wings Creations that were specially created just for this challenge or already on their menu and all will be offered in all of these restaurants from May 14- June 9, 2013. The public is invited to visit any of the participating establishments and order the Chicken Wings creations and then decide on which ones they think are worthy of winning the challenge. We will announce the winning restaurants and their chicken wings dishes on June 12, 2013. It is a new year, and we have our first Vancouver Foodster Food Talks for the year. It is always interesting to hear restauranteurs, chefs, wine makers, and other people associated with providing us with excellent food and drink to talk about their life experiences. 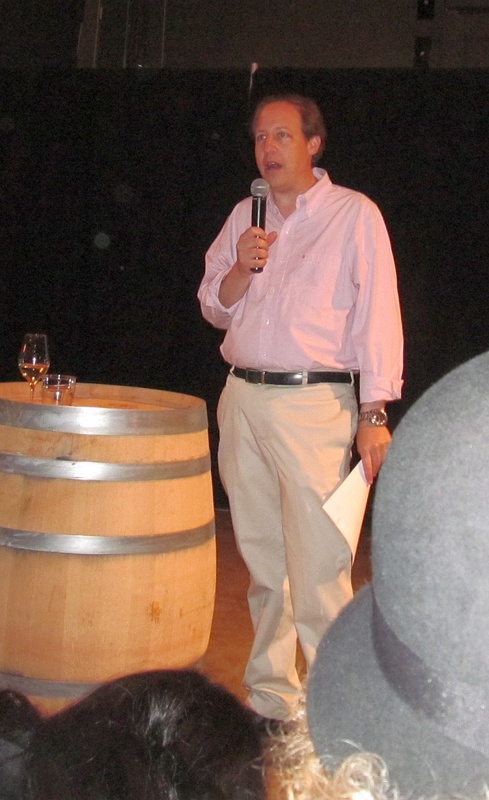 Here is the latest press release from Richard Wolak, aka @vanfoodster about Food Talks Vol. 6. Get your tickets. 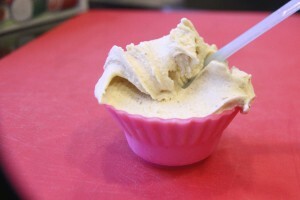 There is gelato in this one! Vancouver, BC – The 6th Food Talk features 5 speakers who are all movers and shakers from the food community will take place on Tuesday, February 12th from 6:30pm-9pm in the Dockside Lounge at the Granville Island Hotel. Richard says “I created the Food Talks to educate people in our community about the food that they consume, it is about awareness as much as it is about lifestyle”; Richard also said “ the Food Talk is also a social gathering which is more than hearing great people talk about their passion, it is also a chance for the community to meet and mingle over delicious appetizers, taste some local beer and ask questions from our leading panel of experts”. Come join us to meet and mingle with other foodies, and to hear some enlightening speakers from the food community. Tickets: $30 per person (eventbrite fee extra) before February 9th. $100 when purchasing a 4-Person Pak of tickets (get a group of your friends together and save $20) (eventbrite fee extra) * $40 per person after February 9th.– A donation of $3 from each ticket purchased will go to support Growing Chefs. Enjoy tasty appetizers by the chefs of Dockside Restaurant followed by a wonderful line-up of speakers who will talk about themselves and their passion related to the food community. There will be a Q & A where you will have a chance to ask questions and engage with the speakers. Each guest will receive 2 tasting glasses of Dockside Brewing Beer, there will also be a draw for prizes and to finish off the evening you will enjoy Gelato by Bella Gelateria. Founded in May, 2012 by Richard Wolak. An educational series of Bi-monthly social gatherings that brings together 5 speakers all of different backgrounds and roles from within the food community in and around Vancouver. Each talk will be focussed on stories and issues from within the food community followed by a Q & A, eating and mingling. Vanfoodster has 3 more events coming up in the New Year. You may want to consider buying a ticket for you and a friend for Christmas. Two events you may know about; Food Talks and Tasting Plates with of course new speakers and new venues to eat at, while the other is a brand new event that I’m super excited about called Noodle Mania. Info on these 3 events are below. Enjoy! with 5 speakers, appetizers, beer & Bella Gelateria Gelato. Speakers include Mark Simpson (Brewmaster of Dockside Brewing Company); James Coleridge (Founder of Bella Gelateria); Marcus Von Albrecht (Chef & President of Mava Foods and Von Albrecht & Associates) and 2 more speakers tba. Looking for the perfect holiday gift for your foodie friends or family members, all of our upcoming events can be purchased as gifts to give. You can purchase the tickets and put them in your recipients name! If you attended my Tasting Plates event in Chinatown and Strathcona recently, Novus TV featured the event last night on City Lights (see here) tv show. If you have been attending the past Tasting Plates events by Richard Wolak aka @vanfoodster you will notice that the menus have something for everyone. The latest menu for the Fall Edition, which is on November 21, is out, and you can enjoy both Asian and European food. Something for everyone. I’m looking forward to trying out the food, and hope I will see you there too. Tickets are at this link. 1) Ramen with Fraser Valley pork shoulder and SOLE food radish. 3) Our 2012 Treasure Green Seasons Blend (hot tea) prepared in tea ceremony style. We will be giving guests a brief tea lesson on the benefits of tea and demonstrate how to make the tea in the GongFu Cha style. Our take on a vegetarian vietnamese sub. Golden-fried, panko-breaded eggplant served on a tiny baguette-style sub bun. Sweet and savory red pepper almond spread, house pickled julienned vegetables, cucumber and Sriracha mayo. Our in house chuck beef slider patty, on a mini brioche bun with sweet and savoury tomato jam, wasabi slaw and butter lettuce. Grey Goose battered ling cod bite on shoestring potatoes with tartar sauce, and red cabbage slaw. Rich and creamy red bean paste panna cotta with a hint of lemon zest. Accompanied with blueberry puree. Thank you to Richard Wolak, aka vanfoodster on Twitter, for putting together these series of talks by people in the hospitality industry. I attended the first Food Talk, and now had the scheduling opportunity to attend the fourth talk. 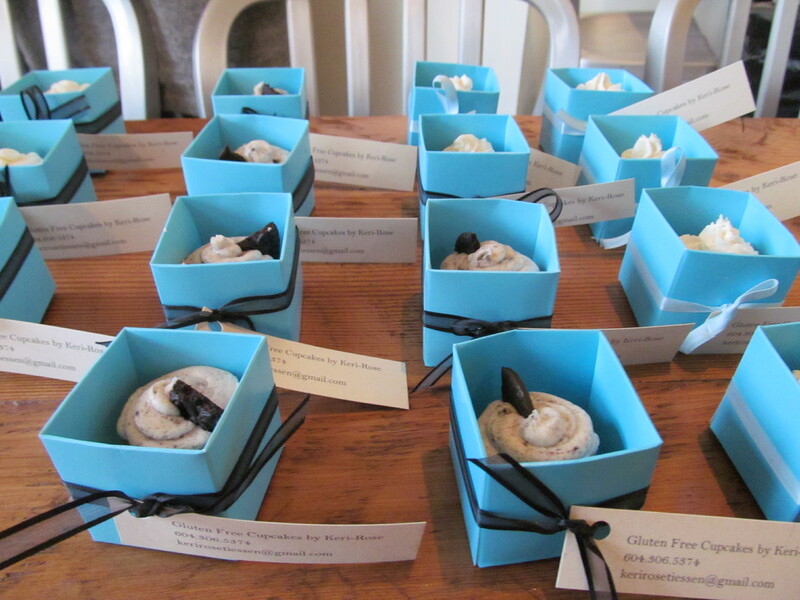 This event was held at Vancouver Urban Winery, a new concept for a winery here in BC and Canada. They will help wine makers produce their wine, as you can see by the stainless steel tanks inside the building, but what makes them different is how they are bottling and offering glasses of wine for you to sample. Instead of putting wine in glass bottles, they are offering to put wines in metal casks/cylinders, which keeps the wine fresh, and allows restaurants and bars to offer more wines by the glass to their customers. That is wonderful, considering the penalties involved with drinking and driving. So no more having to drink a whole bottle, but in return you get a much greater range of wines you can potentially try at a restaurant or bar. 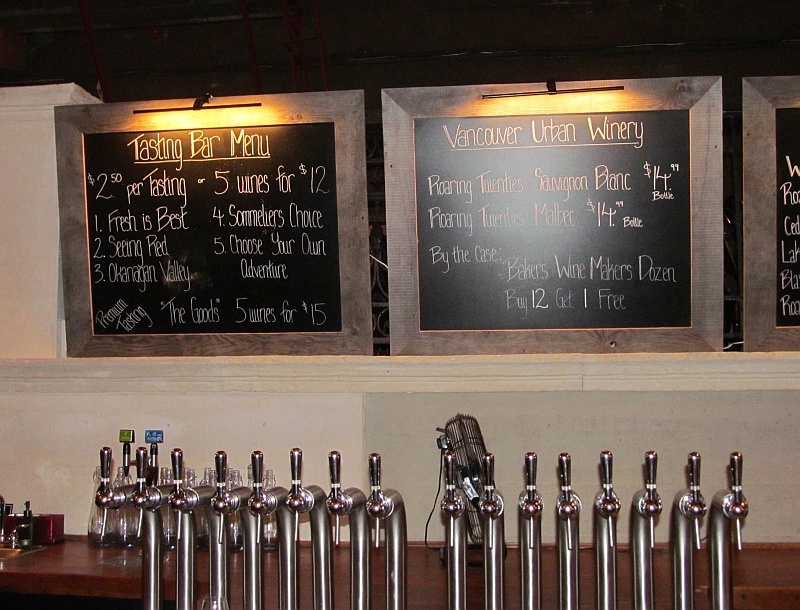 Go to Tap & Barrel in the Athletes village for a bar that offers wine on tap through Vancouver Urban Winery, or go to Vancouver Urban Winery on Monday – Friday. Here are their tasting times and prices. Thanks to Leanne Frose from Okanagan Crush Pad for offering each of us a glass of one of their wines to sample before the talks started this evening. All these speakers talked in one way or another about your need to have passion for whatever you do as the work is going to be hard, and there will be unexpected problems. Passion is a virtue. The other component I saw threading through the talks is that the seemingly sudden success that we see is really a series of many smaller steps over 10-20 years in some cases. It was interesting to hear this from the different speakers, and to hear some of the speakers, like Steve and Mike, who are just getting their feet wet with Vancouver Urban Winery, with their thoughts and passion, and the tempered wisdom of others like couple Emad and Shannon, Greg and Lesley. I have created some youtube videos from some of the speakers for you to access below. I believe videos of all the speakers will also be available at the Food Talks website. Enjoy my videos and pictures of the event! Lesley Stowe, Creator of Raincoast Crisps. 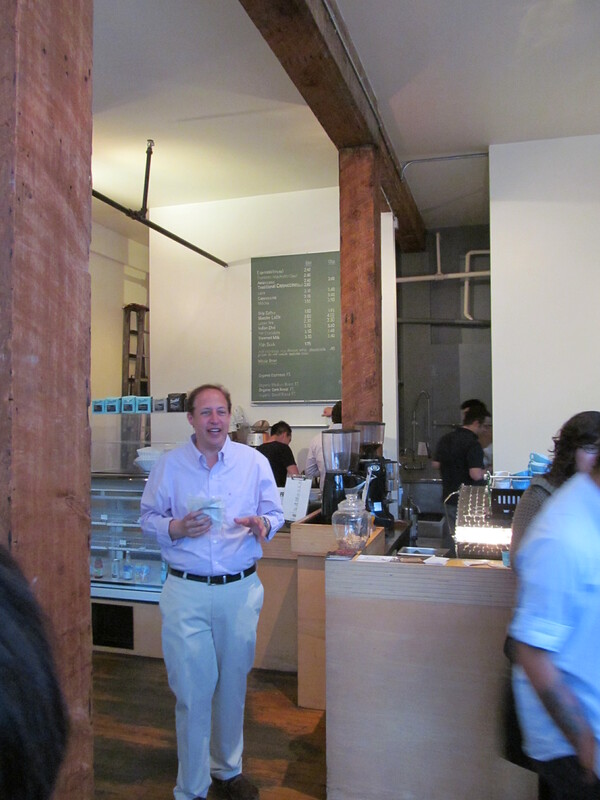 Last week was Richard Wolak‘s, aka Vancouver Foodster, 3rd anniversary party. Richard has been very active visiting restaurants and blogging, as well as having a radio show, hosting Tasting Plates, and Food Talks. Myself and some other select friends who have supported Richard in his journey were invited to a private party at Prado Cafe on 4th and Commercial. The party was very low key and we spent most of our time chatting with friends and making new friends. Prado Cafe was making free coffees for us, a cappucino for me, as well as some sweet and savory nibbles. 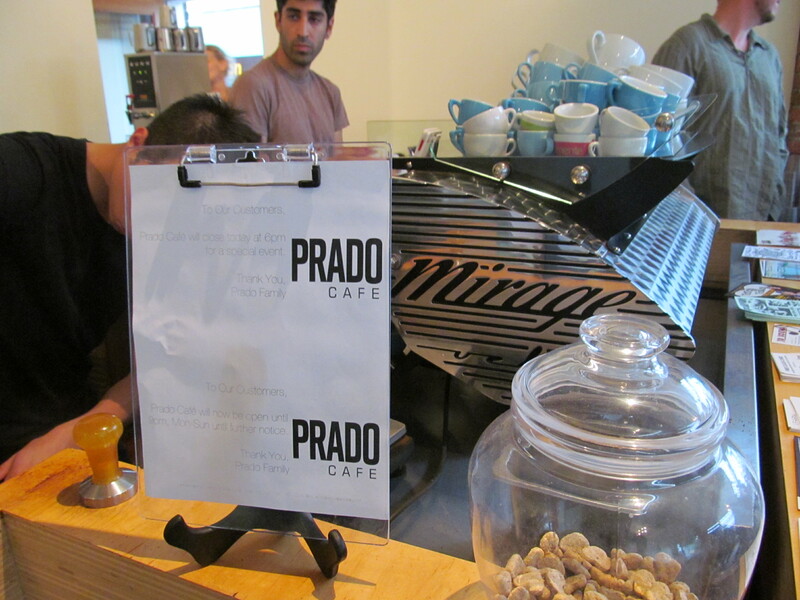 Prado Cafe makes really good coffee with Sammy Piccolo, Canadian Barista Champion. Keri-Rose was also there (first time I met her) and she had gluten free cupcakes for us to try. Overall a fun, low-key event. Thanks Richard and good luck in the future. Enjoy the pictures from the event below. 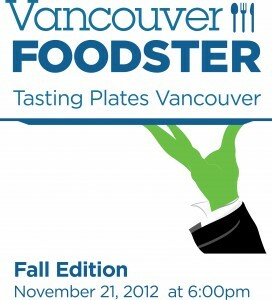 Did You Get Your Tickets for Tasting Plates Vancouver Yet? 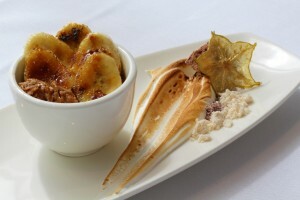 Tantalize your taste buds at over a dozen fabulous downtown Vancouver restaurants at Tasting Plates Vancouver! 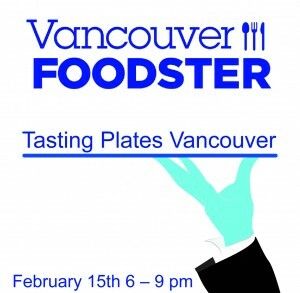 This evening tasting extravaganza goes from 6pm until 9pm on Feb. 15, and is presented by Vancouver Foodster & Taste and Sip Magazine. Participating restaurants will offer tasting plates of their food to the guests, showcasing their restaurant, their food and of course their skilled chefs. If you are a vegetarian, don’t worry. Most restaurants will have a dish suitable for you. The event is a roving tour that will start off at the W2 Media Café at 111 West Hastings, from there you can visit any or all of the participating restaurants that are located all over downtown including Gastown, Yaletown and the West End by driving, transit or walking. Here is a link to a Google Map showing the locations of these restaurants. Also, that night after the Tasting Plates Event, there will be a book launch party which takes place starting at 9pm at the W2 Media Cafe Centre. Richard Wolak aka Vanfoodster will be launching his new book “Vancouver Foodster’s guide to dining and drinking in Vancouver “ (publishing February 2012). There will be draws for great prizes held at the book launch after party too. Enjoy!